Assemblymember Jim Brennan (D-Bklyn) and Senator Tom Duane (D, WFP-Manhattan), supported by Brooklyn Borough President Marty Markowitz and Manhattan Borough President Scott Stringer, announced the introduction of legislation to increase State and City operating support for the MTA and avoid a fare hike. They urged the MTA to postpone the fare hike planned for early 2008 until after the Legislature and the Governor have had a chance to review these alternative funding options. 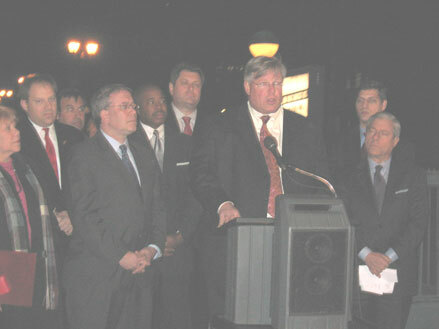 At a press conference held at Brooklyn Borough Hall on November 5, 2007 at 5:00 pm, preceding the MTA's first public hearing on its planned fare hike, Assemblymember Brennan, Senator Duane, Borough President Markowitz and Borough President Stringer urged swift passage of two bills that would add an additional $684.3 million to the MTA's operating budget. "The MTA is facing financial crisis in both it's operating and capital budgets, a legacy of the Pataki administration. Now the MTA is proposing 2 back-to-back fare hikes and this legislation can halt the first one. Swift passage of the bills by the Legislature, with the support of Governor Spitzer and the MTA, is vital to avoid next year's fare hike," said Mr. Brennan, who chairs the Assembly's Standing Committee on Cities and has been a member of Assembly's Committee on Corporations and Authorities for 23 years. "New York State has denied the MTA fair funding and this must end. It is the State's responsibility to step up and end the cycle of financial crises at the MTA. The legislation Assembly Member Brennan and I have introduced would simply end the gross inequity in MTA funding and make dollars available for operations. Our colleagues in the legislature need to act quickly for the good of all the hardworking New Yorkers who use the transit system every day," said Senator Duane. “And very importantly, we are urging the MTA to delay their vote on the fare increase until the legislature has time to act." The first bill, A.9424-A/S.6526, will give the MTA $644.8 million in additional State and local operating support. This contribution to the State Transit Assistance program ("18-b Program") allocates in a 50-50 State-local match $599.8 in new money to NYC Transit and $45.9 million in new money to the commuter rail system. Since 1995, operating costs have risen steadily but State support of the 18-b Program has either declined in some years or remained unchanged. This issue was identified in a report issued in August by NYC Comptroller William Thompson. Brennan is joined in sponsorship of this bill by 19 Assembly Colleagues. The second bill, A.9425/S.6510, appropriates $38.6 million to cover the full costs of reduced fares for New York school children. The City of New York relies upon the NYC Transit Authority to provide safe, efficient and cost-efficient transport for all public school children in return for State reimbursement. Over the past ten years, fares have risen and the State has failed to reimburse the actual cost to the MTA, forcing the MTA to absorb the shortfall. Brennan is joined in sponsorship of this bill by 24 Assembly colleagues. "It's clear that government funding for the MTA falls short, but that deficit should not be made up on the backs of hard-working Brooklynites and New Yorkers," said Brooklyn Borough President Marty Markowitz. "We need to make government accountable for more of the cost of providing a safe, efficient, reliable and affordable public transportation system, and that's what this proposed legislation does. Brooklyn and New York City are on the move-so let's be fair about the fare if we want to keep the city in motion." "Every alternative must be exhausted before burdening New Yorkers with another fare hike," said Manhattan Borough President Scott M. Stringer. "I applaud my colleagues for aggressively pursuing more equitable funding from the City and State. We need to roll up our sleeves and find solutions to looming MTA deficits and funding essential infrastructure improvements that don't involve bleeding financially strapped commuters dry," said Stringer. Listen to Senator Duane's Podcast!